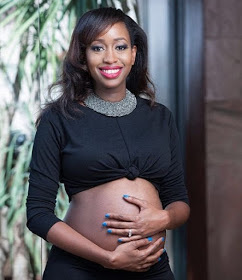 Citizen TV’s elegant and gorgeous news anchor, Janet Mbugua Ndichu has recently taught a social media user some manner, how to respect pregnant women. Of late, she has been receiving mixed reactions from a section of her fans for flaunting her baby bump. Yesterday there was ndrama in the social media after a social media user went decided to lash Janet Mbugua and the later wasn’t reluctant to respond. Ever heard of giving someone a dose of their own medicine? Janet Mbugua knows how to do it perfectly. officialjanetmbugua I can't be jealous of someone who throws in the word 'sponsor' from nowhere. I'm also not saying you're jealous, you just seem confused. I'd appreciate if you'd unfollow me, not a fan of haters on my timeline. Thanks! officialjanetmbugua @ladyshical I don't care for your opinion, you don't have to follow me if you don't like what you see! This is for men and women who celebrate transitions! officialjanetmbugua I'm very happy! Whatever God has in store for me, I'll take it. I think people like @ladshical are very unhappy in their own lives! And yes, very rude!